Art Deco Buildings: Disused Drinking Fountain, Northcote. 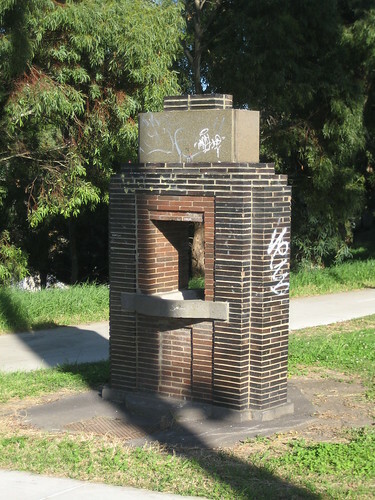 A deco drinking fountain, non-operating, near the corner of St Georges Road and Merri Parade in Northcote. Once it held a place of honour in the community and provided a function of drinking water for walkers and cyclists using the nearby Merri Creek Trail. Now it is unloved and unused. I wonder what those citizens and the late Cr Green's family would think of it now. Oh, the poor little thing! It looks so lonely and lost. And it's beautiful. What a shame. It could be a real asset to the area ... again. wow now that is an interesting piece of design. Love the functionalism of it, lets hope it's restored again - imagine how great it would be on a hot Melbourne summer day! You and I must have crossed paths, I was out there photographing it on Saturday lol. Thomas, we've had a lot of humid weather this past summer in Melbourne which is unusual and I wouldn't want to upset the sceptics by mentioning Climate Change but I would have appreciated a cool drink on my travels. Jayne, maybe we did cross paths. I spend so much of my time looking up at buildings or across the road at buildings that I barely notice the people around me. So where can we see you pictures from Saturday? Jayne, I found your Merri Creek post on your Our Great Southern Land blog. The local government should fix this because it is useful to the people in that area. They should consider that everyone wants to quench thirst. I drank from that tap when I was a kid. It was working back in the late 1970s. Very hand too, since the only options back then were the Merri Creek water (not recommended) or the Milk Bar on Charles Street around the corner, if you had money for a (glass) bottle of Coke or Fanta. Lovely to know that it was a well used feature. I can see why it was a popular option. Shame it isn't functional now.